There are certain words no parent ever dreams will be in their vocabulary let alone will be uttered about their own child, yet 3 weeks ago my vocabulary was given a massive, unwanted and irreversible upgrade and it started with the four simple words; my child has cancer. 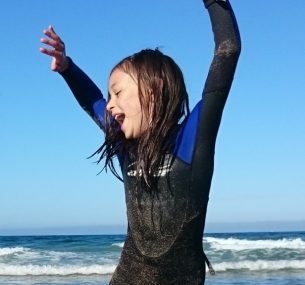 My gorgeous, wild, free-spirited, independent, vibrant little girl has CANCER? Our wild journey has taken a completely unexpected turn in the road. After two months of haggling with doctors to get pain relief for Caroline, for what we were told was an ear infection and swollen gland, I finally battled on the phone for almost 12 minutes to get a fifth appointment to have her examined again by a GP because alternating Calpol and Calprofen had not dented the pain she was suffering. This was February 27th. We were referred to hospital later that day for blood tests for possible mumps or glandular fever. It feels as though we’ve never left. The swollen gland is in fact the external protrusion of a large tumour in Caroline’s head though thankfully not in her brain nor spread to anywhere else in her body. 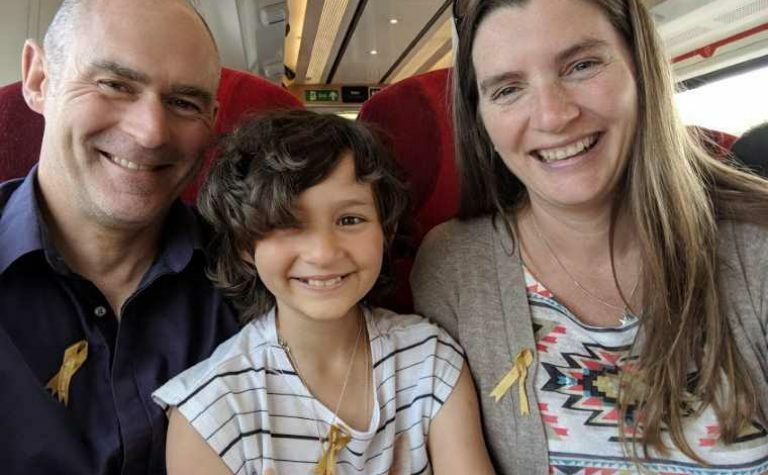 We were kept in overnight and in 60 hours Caroline endured blood tests, an ultrasound scan, insertion of a cannula, an MRI with dye, a CT scan, chest X-ray and a biopsy through the soft palate of her mouth. Sent home for 4 days, we were called back early when the results revealed a rare cancerous tumour, Rhabdomyosarcoma. She underwent further bone scans, a lumbar puncture, bone tissue and marrow checks, had a central line inserted into her chest where it remains for the 9 months of treatment and chemo started, unbelievably, 2 days later. Last night almost all her hair fell out. On Wednesday March 1st 2017 this was our view of the Great North Children’s Hospital. It was taken as we returned from a walk in the local park, trying to get a handle on our upside down world. 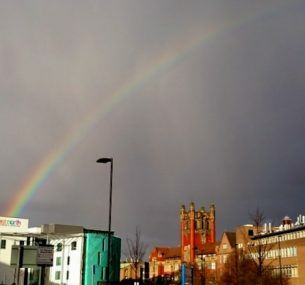 At the bottom of that rainbow at that very time Caroline lay in theatre having a biopsy under general anaesthetic, with an uncertain future. At the other end of the rainbow, the pot of gold we are striving for, is Caroline’s new life, a life that, please God, will be cancer-free and enriched and strengthened by what she must endure in the coming months. No child should have to suffer this and no parent should have to witness it but we are given in life only what we can cope with so we will battle at her side every step of her journey back to health. Heartfelt thanks to everyone who is praying for Caroline and holding her in their hearts and for the staggering support from friends and family over the past 3 weeks. Words cannot express how invaluable your love, support, prayers, positive vibes and uplifting thoughts are to all of us. We are still processing the full impact of this diagnosis on all of our lives, including the lives of family and friends who are equally as shocked and devastated. It seems impossible that in such a short time my vivacious, life-loving, inspirational little wild child has been brought to her knees by the very drugs which will cure this disease but she is one incredibly strong wild warrior and will be back to her old ways as soon as ever she can. I’m not sure what path Kids of the Wild will take as there are obviously far greater priorities now. The hiatus in my blogging may continue or the blog may become an outlet for the trauma of it all. It might even provide room for writing about getting into nature and the wild despite a cancer diagnosis.